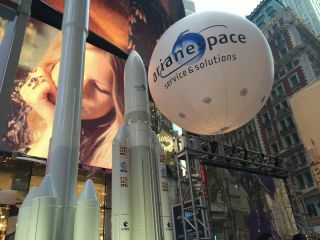 Scale models of the Ariane 5 rocket (right) and next-generation Ariane 6 rocket, near Times Square. Ariane 6 is set to make its first flight in 2020. NEW YORK -- This past weekend (Sept. 26 and 27), New York City hosted the annual "Best of France" event, which aims to promote the country to foreign audiences. The festival showcases many things that most people already associate with France: cheese, wine, the music of Edith Piaf, pop-culture art and extremely relaxed people in nice clothes. But this year's Best of France also highlighted one of the country's main contributions to the spaceflight industry: Arianespace, operators of the Ariane rocket program. At a booth near Times Square, surrounded by other French exhibitors, the company displayed a model of the Ariane 5 rocket, which has made more than 250 launches since 1996. It is scheduled to carry the James Webb Telescope into orbit in 2018. The company also displayed a model of the next-generation Ariane 6, which the company says will make its first flight in 2020. The Ariane 5 rocket featured the logo of the European Space Agency (ESA) and the Centre National d'Études Spatiales, which oversee the manufacturing of the rockets. As the landscape of private spaceflight companies continues to grow, it may be necessary for companies and nations to promote their contributions more directly. A model of the city of Paris, carved out of butter, on display at the Best of France event near Times Square. Credit: Calla Cofield/Space.com. The Best of France festival also featured a miniature model of Paris carved out of butter. We'd like to suggest that next year, the rocket models also be carved out of a dairy product.